Buying for boys is supposed to be easy, right? Get them a car or a superhero something-or-the-other and they’ll be happy. I can’t even remember how many cars and superhero things we’d got or been given for my son over various celebrations, and so many of them were played with in the way most children seem to do – a few seconds of “OH MY GOD, this is AMAZING. I’ve ALWAYS wanted one of these! Can I open it now? PLEASE PLEASE PLEASE PLEASE?”. We’d agree because he obviously really wanted it (don’t laugh, we were naive first time parents). Some toys would get half an hour of play, others would be the new favourite for about 2-3 days. Not many stood the test of time with my little boy. This may be because he’s one of those boys that’s not really “into” toys. He doesn’t like playing with action figures, he’s not one for a lot of make-believe. He’s a little geek boy, and, as geeky parents, we couldn’t be prouder!! We soon realised what kind of things “work” for him and found some real gems. Most have grown with him and, even though he’s a little older now (but still under 11), he still enjoys playing with many of these. Here are the boys toys that were a hit in our home from the toddler years and up to around age 8-9. They’re in no particular order, except for the one my mum-brain remembers them in! We were given a starter Trackmaster set when my son was around 4 years old as he was really into watching trains and other vehicles. It’s very easy to put together and we helped it do it the first time. He LOVED watching the train go around and around…and around and around. It kept him busy for hours. At one point I think I even checked to see if he had fallen asleep watching it, but no, he was happily watching it! 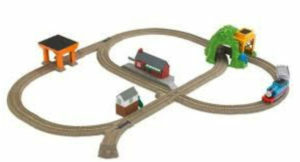 We showed him that you can build tracks in different designs and from then on, he’d constantly be making new tracks. We kept adding to the ones he had – either buying new tracks (glow in the dark ones were great) and different “scenes” – e.g. a bridge, the Whistling Woods and many more – and they all join together. We also bought switches and junctions and as he got older he loved seeing how everything linked together and what would happen if he did it this way, or that way, or which trains went a little faster. He’d build a huge track, many times taking over the entire living room, then set a number of trains off at various points and then run around trying to set the correct switches so the trains would be going in the right direction and not crashing! He’d often get us involved and we’d all have a switch that we were in charge of, and he’d tell us when to flip it. He plays with these less now but still occasionally goes back to them, especially during school holidays, so it’s not been donated to anyone yet! The Trackmaster section is still one of the first places he heads to when we go to any toy shop so it still holds his interest. 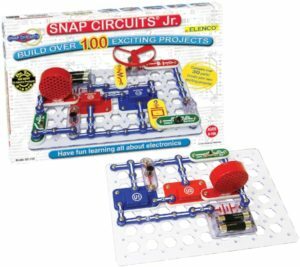 I’d highly recommend this – get a starter set and, if your child likes it, you can add to it for years. It also helps develop fine motor skills, logical thinking and creativity, so plus’s all round! You can buy it from most major toy outlets, including The Entertainer, Hamleys and Amazon. We started off with a children’s pair of walkie-talkies but found the ones we had didn’t have good range and had a lot of interference, even in the flat we lived in at the time, so we did some research and ended up buying “proper” walkie-talkies instead of toy ones. They’re a little more fiddly to use so they’re probably better suited for aged 7 and up but they’re definitely worth it. They have a few channels to choose from and, as we live near some shops, we sometimes randomly hear one of the local shoe shops on one of the channels requesting sizes and styles from the people in their stock room – which my son gets a real kick out of! (I will neither confirm nor deny that my husband may or may not, on various occasions, have requested a different size or colour from the comfort of his sofa, causing the shoe shop to change the channel they’re using for the rest of that day). My children both love to play with these – the beeping can get a little annoying if, as a parent, you’re having one of “those” days, but it keeps the children entertained so it’s definitely a winner for us! 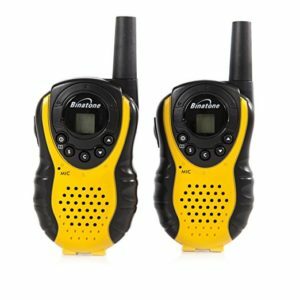 These walkie talkies have actually been useful for us on holidays too – we will often take these with us and use them to communicate with each other if we end up doing different activities or having to take one of the children to another area for something. It saves having to take our phones or connect to wifi or use data and also saves us wasting time walking around trying to co-ordinate what plans for food are! They can be charged via mains and the charger also doubles as a stand to keep the walkie talkies in when not in use. We bought ours from Amazon and they were around £20-25 which, considering the “toy” ones are usually around £10-15, we thought was a good deal. We had the Bop It Beats edition given to my son by one of his school friends for a birthday. 8th, I think. It was one of those things that I actually didn’t think he’d so was pleasantly surprised when he kept going back to it to play. It has various challenges and games on it, like patterns that you follow (tap-spin-flip in the required order or do-something-everytime-you-hear-a-sound sort of thing) and he enjoyed most of them. As we had the “Beats” edition it had one or two songs on it that are constantly part of the challenges/games, so I guarantee that if you get this version you’ll get those songs stuck in your head too. 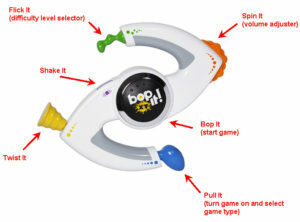 After a while, when you hear those songs on the radio they’ll sound like something’s missing as you won’t have the Bop-It guys voice saying “tap it”, “bop it” throughout!! I don’t mind the songs so this didn’t bother me at all. I’m not expert but I felt it’s a good toy for developing memory and concentration as you have to see how long you can follow and keep up with the challenges up for and it remembers the best score and offers words of encouragement. There’s no volume control so it’s not a toy you can pack for, say, a plane journey, but other than that I’d definitely recommend it. I can’t find the Beats edition we had online but I’ve heard from other parents that the regular version is just as good. My son was one of those toddlers that loved anything on wheels. He loved to push this shopping trolley we got from Toys ‘R’ Us and it lasted a long time (I think it’s still in around in the garden shed and comes out when the children are playing in the garden during summer!). 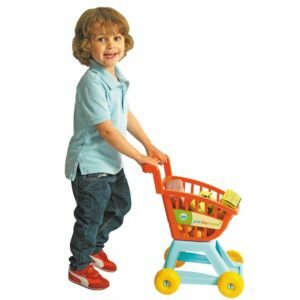 He’d put things in the trolley and “deliver” them to us, or pretend he was out shopping by himself. Whenever we’d have children over for playdates they’d all try to push the trolley so it was a winner with almost all the children we knew! It’s not expensive either – less than £20 so it’s definitely a good deal and well worth it. My daughter played with this a lot too so we definitely got our money’s worth with this toy! Honestly, I don’t think any list of great toys would be complete without Lego! As I’ve already mentioned, my son loved anything on wheels so Lego City was the perfect Lego option for him! There’s a HUGE range of sets, from smaller vehicles to big items like fire stations. I think, at one stage, we had almost every major set in the Lego City range! Like all Lego sets, each comes with an instruction book that has step by step picture instructions. Each page tells you which pieces you’ll need for that step and how they fit together. Some vehicles can be put together very quickly, and the bigger sets can take a while – I think it took my boy a few days over Christmas holidays ones year to build the fire station. There are cars, emergency vehicles, boats, helicopters and more. My son got into these when he was around 4-5 years old – some of the pieces are quite small so it’s not really suitable for children younger than that, but he still plays with it now at age 10. And as there is such a huge variety of sets available it works for all budgets. You can buy Lego City from most toy outlets and there are often really good deals available.